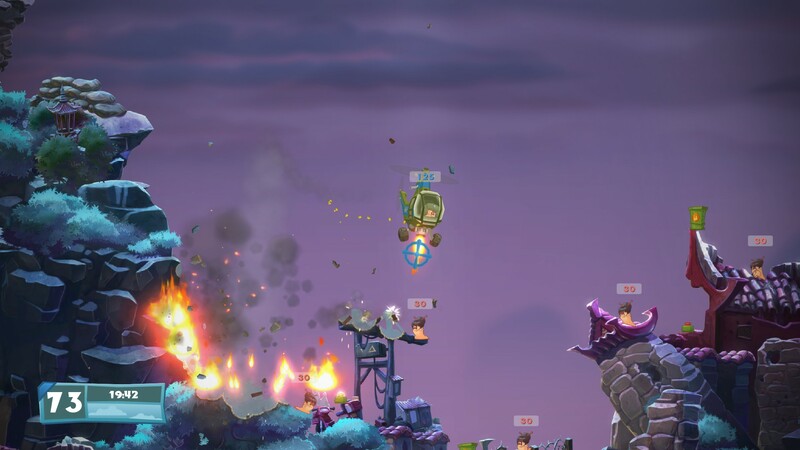 Review: Worms W.M.D All-Stars | "DESTROY ALL FANBOYS!" Team 17’s very disposable heroes are back in another great game guaranteed to never leave your playlist. I never even thought I’d ebe a Worms player until back around 1997 when I got conned into joining a game a few folks were in that needed one more willing victim clueless about was was coming. I was new, but wanting to learn the (ninja) ropes and figured things would go pretty easy for my team. Nope. After some initial wriggling about, the other players proceeded to fry my poor worms up like bacon and I think it took about half a dozen or so more attempts to realize the bums I was playing with were just looking for someone less skilled to gang up on. Feh, but I was now hooked into the game and have continued to enjoy most of them since. Flash forward a bunch of years and with Worms W.M.D on the scene, Team 17 has both gone back to basics on a few fronts while expanding the game into current play trends. That very handy once mastered Ninja Rope is back, but you also get on the fly crafting that allows anyone to tinker with item drops to create game-changing goodies. Of course, this means the more mean-spirited gamers out there will be ganging up on newbies as well as veterans to deliver some awful beat downs that aren’t exactly “tactical” in nature. However, the game packs in more than enough option tweaking and so much content that you can find a happy medium of polite players who merely want to even more politely destroy your little worm army into polite little pieces. Look, you’re hopefully NOT going to buy this game and expect a certain not always positive segment of the gaming community to NOT want in on the “Kill ’em All!” fun. You can always avoid these guys and gals like the plague, by the way. But it’s definitely a lesson in something resembling modern social online behavior when you’re in a match and seeing someone play poorly for a few turns only to turn around and dominate the map. Or see some poor polite, tea-sipping player get ganged up on by giggly sharky-sharks who then turn on each other like sightless, starving piranha. I say dive into this worm-packed pond feet first as a solo player, do the tutorials that unlock some cool stuff, and then tackle the Campaign mode so you’re up to the basics and more. Going online without a plan other than “Play game, NOW” will result in you maybe busting a controller or keyboard in anger. The very healthy list of setup options will be your best friend for couch versus as well as multiplayer online games. Tweaking everything from the look of your team, the frequency of crate drops, and so forth and so on all add to the longevity and make this a superb value. YES, a few features aren’t in play from older games, but guess what? If you consider yourself a Worms fanatic, you make do with what you have and get damn good at it. Besides, item crafting is a mostly beautiful thing, allowing you to whip up new weapons from old ones and use them on your hopefully surprised enemies. Vehicles are another cool new addition, and YES, optional if you don’t want to use them. Personally, I love the helicopter, tank, and mech because the added mobility and firepower make matches more fun to play, but less for either side if unpreparedness comes into play. 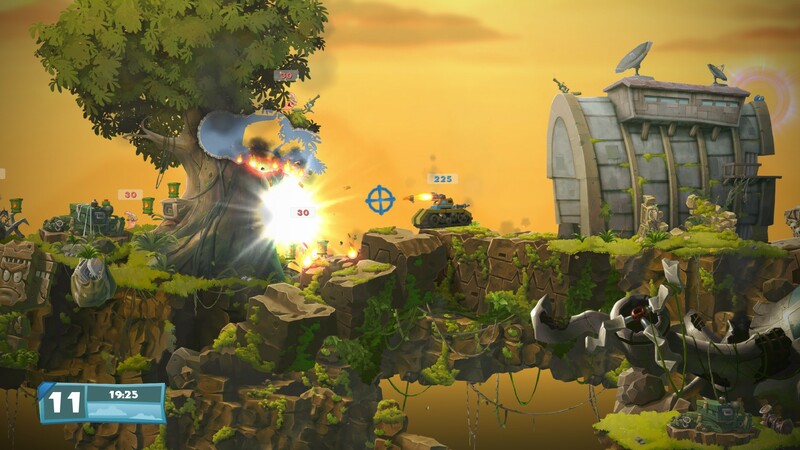 Playing a few maps with vehicles made me want to see a Metal Slug/Worms mash-up at some point, but I don’t know if Team 17 wants to tackle another arcade shooter in the Project-X or Alien Breed style. I’d buy those for sure. Meanwhile, back at the ranch, the All-Star version contains a nice chunk of DLC content based on popular games from Rocket League, Payday 2, The Escapists and more. None of it is “needed” to make the game better and YES, you can still find launch day copies at retailers for console that have all that content if you really want it. Presentation is great overall, with really nice 2D art that looks completely hand painted, plenty of comical tunes and voice samples to keep you grinning. Movement seems a bit trickier now (the worms seem less agile when jumping), but with practice you get accustomed to a few quirks. Sifting through menus can be a chore if you’re not willing to do more than slap a quick game out. Hey! Try MAKING games for a living, kid. That’s harder work! Some online are grousing about the pre-order DLC maybe not being available to latecomers (Team 17 never said this, but the internet has to be outraged about stuff, right?) and the game not being 100% cross platform (i.e., PC users can’t play with Mac users and such). But given this is a war game where you blast the stuffing out of an enemy troop of worms with your own troop of worms, I’d say just play on what you own with those new people in order to make new friends and rivals. Worms don’t have cooties, last I checked. 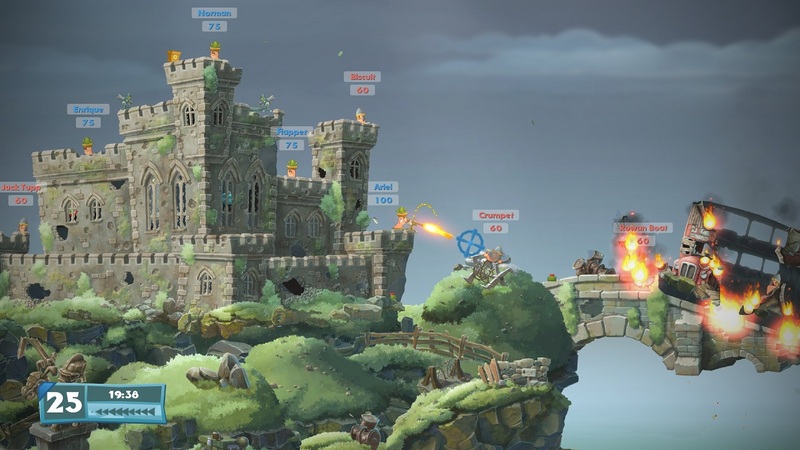 With longevity a big thing for gamers these days and SO many titles, it’s good to see Team 17 still making sure Worms is around to test the skills and patience of both longtime fans as well as total newbies. Granted, the more jaded player who can’t do anything but demand perfection will find a bit more to grouse about with a few elements. But these days, game making is in part a tug of war between good to lousy ideas one WANTS to see in a game versus a developer who can add these things to the code after an appropriate amount of feedback. In a nutshell: buy this one, play it to death and toss your input the Team’s way if you think this needs more stuff. I’d say they’ll at least read what you write and take it into consideration at some point. This entry was posted in 2016, Commentary, DAF, Features, Humor, Updates and tagged Holiday Gift Guide 2016, PC, PC Games, PlayStation 4, PS4, Reviews, Screenshots, Sony, STEAM, Team 17, USA, Valve, VGA 101, Videogame Appreciation 101, Videogame Reviews, Videogame Trailers, WORMS, Worms W.M.D, YouTube by geelw. Bookmark the permalink.